This laptop case is the epitome of just right. Just the right size, just the right organization and just the right features. 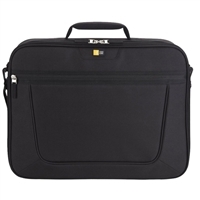 A protective laptop compartment and organization for your commuting essentials allow you to arrive at your desk or scheduled meeting feeling perfectly prepared for anything. 16.4" x 1.7" x 11.8"
18.5" x 3.5" x 15.8"